I received 50K miles from the Delta Gold card signup bonus and would like to cash in. However, this particular flight would take me 3.5K to 5K miles over. Am I able to use my miles and pay the remainder in cash for a Delta flight? If so, how can I accomplish this on their website? As far as I know, Delta, like most other airlines, doesn't give customers the option to directly buy tickets with a combination of miles and cash. 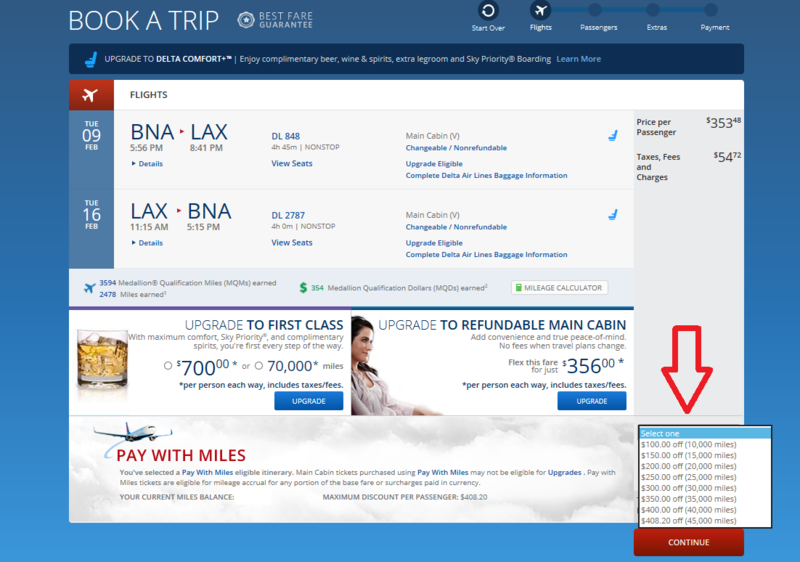 The closest option I know of is that you can use money to buy miles (see the "SkyMiles" tab on the Delta home page). You could buy the additional miles that you need, then book the flight using miles only. Unfortunately, the pricing for buying miles is pretty unfavorable. You don't get to see the prices until you log in (so they may offer different prices to different people, perhaps depending on elite status), but for me, the price is 3.5 cents (USD) per mile, in 2,000 mile increments. (So you could get 4,000 miles for $140 or 6,000 miles for $210.) I usually figure the fair value of a mile is about 1 cent or less, so these miles are overpriced by a factor of 3.5. You may want to consider paying cash for this flight (which also gives you the choice of shopping other airlines), and saving your miles until you have either earned some more, or want to go someplace cheaper. Under the Delta Pay With Miles program, you can purchase Delta flights with a combination of miles and money, but you need to have one of the Delta co-branded American Express cards and purchase your tickets directly from Delta in order to do it. So, if you still have that Delta Gold AmEx, you can do this. The eligible cards are the Delta SkyMiles Gold American Express, Delta SkyMiles Platinum American Express, and the Delta SkyMiles Reserve American Express. 1) Select your itinerary as usual with it set to show the prices in dollars, not in miles. 3) Proceed with the remainder of the check-out as you normally would if paying for the ticket with cash only. If I remember correctly, you are required to purchase the ticket with the Delta co-branded AmEx if you choose the Pay With Miles option, but that might not be correct. When using the Pay With Miles option, you are required to redeem at least 10,000 miles in increments of 5,000 miles. The redemption rate is 100 SkyMiles per U.S. Dollar of fare (i.e. $0.01 USD per SkyMile.) You can usually get better value than this by just purchasing an award ticket directly with miles, but sometimes this option can be useful if award ticket availability isn't good. Not the answer you're looking for? Browse other questions tagged loyalty-programs fares delta-air-lines or ask your own question. Can I do anything useful with a small number of soon-to-expire US Air Miles? Can I pay for one traveler's round trip fare to Scotland and use miles for the other traveler's fare on United?